During the Second World War 2,549 service men and women from Portsmouth were killed in their wartime occupations and this book by James Daly uncovers their stories. It includes stories of a bomb disposal petty officer awarded the George Cross, a 16 year old paratrooper and a battle of Britain hero. James Daly is a history graduate with a lifelong interest in military history. 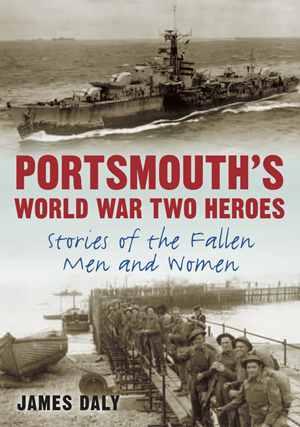 The book provides some interesting stories about Portsmouth people during the World War II. The book not only tells the stories but features many photos to complement the interesting stories. The peoples stories in this book are previously untold stories. The book will be of interest to anyone interested in World War 2, or the history of Portsmouth and is very competitively priced.